Veteran Coburn (No Way Home, 1992, etc.) hails from New England, but his new mystery, first published in England in 1984, is new only to Americans. Everyone in the small New Hampshire oceanfront town of Boar’s Bluff, even outsiders living in summer rentals, is shocked when the body of local dentist Stephen Dray washes ashore, shot to death. Hetty Nelson, the beachcomber who finds the body, knows that when she phones the sheriff’s office she’ll get either widower Paul Jenkins, the town’s beloved and respected sheriff, or his deputy, sadistic wife-beater Wilbur Cox, who covets the sheriff’s job. State Detective Haas, tossed into this powder keg to help with the investigation, is kept busy with Dray’s numerous extramarital girlfriends, his long-suffering wife Cora, and her dimwitted brother Bud Brown. The Sheriff’s laudable attempt to focus on the three handsome women in a nearby beachfront rental is soon complicated by a second murder—the victim this time Lyman Arnold, the no-good son-in-law of town VIP Ed Robertshaw—and by a vicious attack on Bud Brown, who lies comatose in the hospital. It takes all the skills of the sensitive Jenkins to ferret out the secrets behind the carnage. 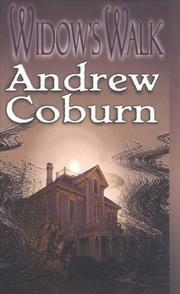 Coburn’s style is terse, almost staccato, but his formidable skill at character portrayal and plot development would make the publication of his British backlist more than welcome on his native shores.